I’ve been thinking lately a lot about line. When I look at the world, I often don’t see shapes and shades; I see lines between objects, between darker and lighter areas, between shapes. Many of my art teachers have focussed on trying to get me to focus less on lines, to let distinctions between things meld together, so I’ve abandoned line a lot. Here is a revisitation. 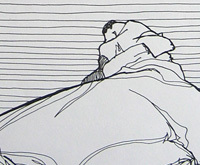 Look at the whole drawing, and give your mind a minute to process what it is. I’ve done a lot of updating to the art store in the last week. 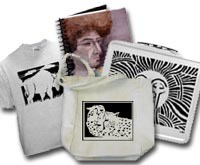 There are now a bunch of new products, new product designs, and the whole store has a new design. The homepage especially! 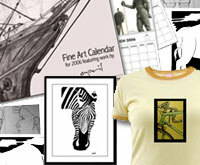 The most exciting new product is a 2006 Wall Calendar, which has some artwork for every month. 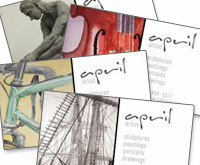 There are also calendar prints (one picture for the whole year) and some new cards and postcards. 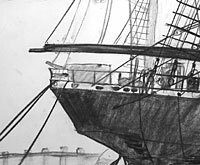 There used to be four drawings of ships on my website. Now there are 10. Somehow, I only ever photographed and put 4 of them on, but there were 6 others lying around as of this afternoon. Now they’re all up for everyone’s viewing. After nearly 6 months of procrastinating, I finally got my act together and designed some artist contact cards (like business cards, but for an artist). I’m quite pleased with all of them … I just have to decide which ones to get printed first. There are 9 of them in all. I’ve put up 12 pieces of my work in a showcase in an SVA building. It will be there until September 10th, so make sure to drop by and take a look. 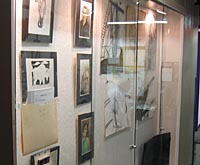 Pieces in this show include 3 charcoal drawings of ships, 4 watercolor portraits, 1 pencil drawing, and 3 papercuts. If you get over there soon enough, you may be able to get your hands on your own “artist card,” which are little cards I printed up at Kinko’s. Each one has a small print of one of my pieces on it. Check out the store! If you want something that you don’t see, let me know and I’ll make it available. My new hosting provider, Dreamhost, provides a service whereby visitors to my website can contribute directly to my hosting bill. If you’d like to donate a dollar or two or 10, you can do so by clicking here and following the instructions. Thanks! Last night I did some more work on my stone sculpture. I took down his right cheek because it was too hight in comparison to the left one, thinned out his jaw a bit, scaled down the nose, and scaled down the chin. Hmmm … seems to be a pattern. There’s been no scaling up! Sigh. Anyway, there are no new pictures, but I’m including a link to The Compleat Sculptor, the store where I’ve been taking this class. This picture is of their advertising postcard for their class. Now, no more stone man until July. I’m taking June off from the chisel. Took down the nose almost 2 centimeters. You can see the half-way process in this pict. I’m discovering that sculpting in rock for me is really proving to be an important part of the process of my artistic development. I always try to be so in control and so safe when I’m doing my artwork and it has been a life-long struggle to take a deep breath and then some risks. Since I can never ever undo any step in the rock-sculpting process, every move I make is an irreversible risk (unlike in clay, or even watercolors). The changes are rather subtle, but I assure you that they are there. Last night produced no progress, due to illness, but you can see in this (and these) picts the results of last week’s work. The face is much skinnier and rounded, and I removed a few pounds of rock from between the bottom of the eyes and the chin. I had to take down the level of the cheeks, there, because I carved the eyes in quite deep. See the development picts here. The last two weeks, with the support my mentor who is now back from her trip around the world, have seen many changes in the rock. He now has less nose, something resembling eyes, and a slimmed-down facial shape. Next week I will need to take down the cheeks slightly to accomadate the sunken eyes, spend some time on the neck, and round the edges of the face more. It’s all about subtraction. See the album for two larger pictures. My new rock has had some 10 hours of work on it since I began torturing it. I almost want to name this rock … but think that’ll have to wait until I learn more about who’s trapped in there. He (yes, I think it’ll be a man) is already starting to show me some of his characteristics. I spent a lot of time with both my flat chisel and my rasp yesterday, and have cheese-grater-like hands to prove it. You can see two new photos here and here and if you’re really clever, you’ll find the third pict, too. last night i spent another 3 hours on the new white stone. i’ve defined the nose and chin, started clearing rock away from the neck, and place outlines for the edges of the face. unfortunatley, i neglected to bring my camera, to visual updates will have to wait until next week. yesterday i put up a new homepage on this site. currently it features a changing image. there are nine images, one of which is selected randomly (as randomly as a computer program can be, anyway) each time the page is loaded. my stone was last night deemed NG. aillene came to investigate the chipping that i mentioned to her, gave a few experiemental expert taps, and asked “would you be heartbroken if you had to start all over again?” Well . . . YES! Sigh. so now i am the proud owner of a brand new stone, this time a hundred and fifty-one pounds of dependable semi-translucent white italian alabaster.